In 1890 Sir Henry Tate (1819-98) commissioned a painting from Luke Fildes, the subject of which was left to his own discretion. The artist chose to recall a personal tragedy of his own, when in 1877 his first son, Philip, had died at the age of one in his Kensington home. Fildes’ son and biographer wrote: ‘The character and bearing of their doctor throughout the time of their anxiety, made a deep impression on my parents. Dr. Murray became a symbol of professional devotion which would day inspire the painting of The Doctor’ (Fildes, p.46). Fildes invented a new setting and characters for his painting, and in 1890 he made several sketches of a fisherman’s cottage in Hope Cove in Devon. He used this visual evidence to build a replica of the cottage in a corner of his studio in Melbury Road so he could experiment with the effects of lamplight while dawn was breaking in to the dark interior. The doctor bears some resemblance to Fildes himself. However he may have used more than one model for this figure, his ambition being ‘to put on record the status of the doctor of our time’, rather than to record the likeness of any one individual (The Times 17 March 1891). The child was painted from studies of the head of his daughter Phyllis and the arm of his son, Geoffrey (Treuherz, p.89). Fildes made a number of sketches for the painting, six of which are preserved in the Tate archive. Although hastily drawn, one sketch reveals that the artist’s original intention was to place the doctor on the right hand side of the canvas observing the boy who is seated in an armchair, rather than laid out flat across two kitchen chairs. In the background the position of the husband and wife has also been reversed although their physical gestures are the same as in the finished picture. The most detailed part of this sketch is the grave expression on the doctor’s face which is the focal point in the final version. The composition of this study is similar to a smaller oil study of the painting in the Robert Packer Hospital in Sayre, Pennsylvania. 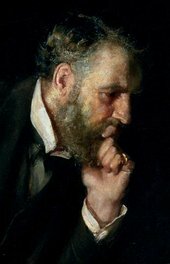 Fildes wrote to Tate later in 1890 to re-assure him about the subject of the painting and, he added, ‘all other questions as [to] pictorial excellence, conduct of treatment must be left unprejudiced by this sketch – which has been done vaguely purposely to leave me as free handed as possible in the artist’s arrangement and treatment of the very large picture – but there is no vagueness whatsoever about the subject, that you can see clearly enough and that I understand, is what you first desire to be satisfied about ...’ (TGA 7811.2.25). A fortnight later in a letter to his brother in law, the artist Henry Woods (1846-1921), Fildes described Tate’s reaction to the sketch: ‘I fancy he was pleased with the idea and when I told him I should require £3000, he assented and letters were passed to that effect’ (quoted in Fildes, p.118). In the final version of The Doctor Fildes paints a young child in a rustic interior lying across two chairs, his pale face illuminated by the glass lamp on the table. The doctor, dressed in a tailored suit, sits beside the makeshift bed looking down at his patient anxiously. The boy’s father, standing in the background with his hand on the shoulder of his wife whose hands are clasped as if in prayer, looks in to the grave face of the doctor. Their humble lifestyle is evident from the pewter, the scrap of carpet on the stone floor and their ragged clothing. The extent of the youth’s illness can be seen by the half empty medicine bottle on the table, and the bowl and jug, used to relieve the boy’s temperature, on the bench. The bits of paper on the floor could be prescriptions made out by the doctor for medicine now already taken. Fildes described the shaft of daylight as signifying the imminent recovery of the child. He wrote: ‘At the cottage window the dawn begins to steal in – the dawn that is the critical time of all deadly illnesses – and with it the parents again take hope into their hearts, the mother hiding her face to escape giving vent to her emotion, the father laying his hand on the shoulder of his wife in encouragement of the first glimmerings of the joy which is to follow’ (Simon Wilson, Tate Gallery: An Illustrated Companion, London 1997, p.90). One year after Tate’s commission, The Doctor was exhibited at the Royal Academy. Agnews immediately published an engraving of it which sold over one million copies in the United States alone and became one of the most profitable prints made by the firm. The popularity of the painting confirms the popularity of social realism in art at this time, and Fildes was one of a number of artists, including Frank Holl (1845-88) and Hubert von Herkomer (1849-1914), whose paintings of the hardships of working class life were widely reproduced in The Graphic magazine. The Doctor was one of the fifty-seven pictures offered by Henry Tate as a gift to the nation in 1897. 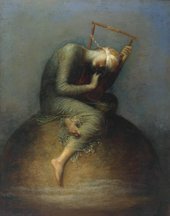 This painting was inspired by the death of the artist’s son and the professional care of Dr Gustavus Murray who treated him. But this work shows the moment when a child shows the first sign of recovery. The light of dawn filters through the shutters behind the anxious parents who have sat up all night. In order to make the picture convincing, Fildes constructed a cottage interior in his studio and began work at dawn each day to catch the exact light effect. The image of an ordinary doctor’s quiet heroism was a huge success with the public.